Did you know that many black superheroes are from Detroit, Michigan? If you're like me, then you're always on the look out for minority superheroes, which is why a strange connection caught my attention. 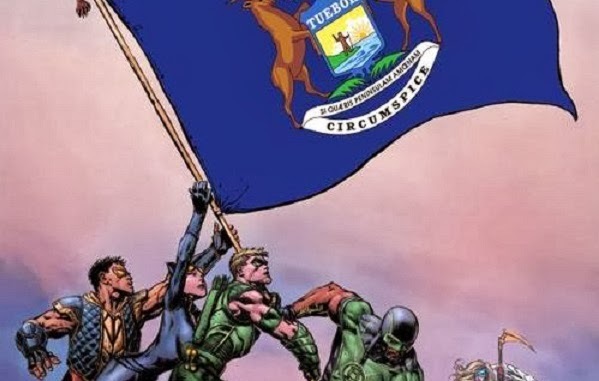 Motovo's real estate blog posted an article called, "30 Things You Need to Know About Detroit Before You Move There" and writer Ian Douglass highlights an interesting connection between black comic book heroes and the "Motor City." "With 82 percent of its population self reporting as black or African American during the last census, Detroit has the blackest population in the country by percentage for any city with more than 100,000 residents," Douglass wrote. "Maybe that’s the reason Detroit is one of DC Comics’ favorite cities for telling black superhero origin stories, like those of Amazing-Man, Green Lantern (John Stewart) and Firestorm (Jason Rusch). And those who aren’t born here end up living here anyway; the television series of Marvel Comics’ famous vampire hunter, Blade, was set in the Motor City." In the 1940s, Amazing Man (Will Everett) was DC comics' very first Black superhero and he's from Detroit. DC Comics has other superheroes from Detroit. For example, Cyborg (Victor Stone) is from Detroit and so is Steel (John Henry Irons). The first Justice League spin-off organization is based in Detroit and has several prominent black members including Vixen (Mari Jiwe McCabe) and Dale Gunn. Marvel uses Detroit too since, for example, Firebrand (Gary Gilbert) is from Detroit. Milestone Comics, the first African-American comic book line, was set in Dakota City which was based on the city of Detroit. So what gives? Why are so many black superheroes from Detroit? I've never been to Detroit, but I can think of a few reasons. There's the 60s R&B and soul movement known as "Motown" which dominated American culture. Plus, between 1910 and 1980, a large number of African Americans from the Southern United States migrated to Detroit and increased the black population over 100 times. This, combined with the so-called "white flight," left the African American population dominating the city. It seems weird though. Why is one city singled out as the home of so many African-American superheroes? Is this surprising to you? Why do you think so many black superheroes are from Detroit, Michigan? That is surprising to me. Honestly, its sounds like laziness on the part of the creators to me. Maybe each person thinks they are doing something unique and all that but never bothers to check to see anyone else has done the same thing. I figured part of it is Geoff Johns, one of DC's top writers, hails from Michigan. But yeah they could at least use Flint or Saginaw or somewhere more obscure. Though really we could use a few superheroes here in Detroit. Very interesting I never looked at it before. Seems like an odd location. If Geordi La Forge was here he'd be able to tell us, crikey I'm stumped. I've been to Detroit, and I thought it was pretty culturally diverse. There are some VERY ugly parts of Detroit, but being from St. Louis, it's pretty much on par with East St. Louis. Maybe the next black superhero should be from Connecticut.